Prototype: German Railroad, Inc. DB AG type WRmz 135.0 dining car for the EC 9 Tiziano, in use between Braunschweig and Chiasso. Product paint scheme. Single arm pantograph and a small roof transformer included. The car looks as it did in the summer of 1995. Model: The dining car has an mfx digital decoder and extensive sound functions. The minimum radius for operation is 360 mm / 14-3/16". The underbody and skirting are specific to the type of car. The dining car has type Minden-Deutz heavy trucks with disk brakes and magnet brakes. It also has factory-installed interior lighting that can be controlled digitally. Different light functions can be controlled separately in digital operation. Maintenance-free LEDs are used for the lighting. A pickup shoe is mounted on the car. The 7319 current-conducting couplings or the 72020/72021 current-conducting couplers can be installed on the car. The loading of the dining car with beverage crates or filling the refrigerators can be heard as background sounds. There are also different typical sounds from this time. Passengers order breakfast or beverages and then complain. The waiter and the cook are also in the dialog. Total length over the buffers 28.3 cm / 11-1/8". Type WRmz 135.0 for the first time in the scale of 1:93.5. Cars to go with this dining car can be found in the Marklin H0 assortment under item numbers 43309, 43310, and 43876. 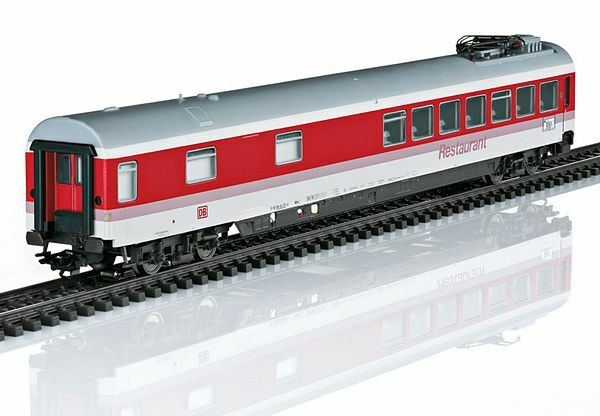 A locomotive to go with this dining car would be the class 120 electric locomotive that can be found under item number 37529 in the Marklin H0 assortment.